Have you ever had a difficult time deciding the perfect Christmas gift? My wife Kelly and I are celebrating our fifteen-year anniversary this year, and believe me; you can’t stay married that long unless you learn a thing or two about giving the right gift. Believe it or not, I learned about choosing the right gift in the Bible! Here are two things that I always try to remember during the Christmas shopping season, and some things to take with you during the New Year! First, the perfect Christmas gift must represent the personality of the giver, so when choosing a gift, don’t forget to give from the heart. God sets the perfect example in that all of his gifts, including the most important gift to humanity, Jesus Christ, represent His loving, and giving personality. Jesus is God's perfect gift to the world. He is fully God and fully man. "In Christ all the fullness of the Deity lives in bodily form" (Colossians 2:9). He is God in the flesh. The beloved John tells us, "In the beginning was the Word, and the Word was with God, and the Word was God. He was with God in the beginning" (John 1: 1,2). "The Word became flesh and made His dwelling among us. We have seen His glory, the glory of the One and only, who came from the Father, full of grace and truth" (John 1: 14). Second, the gift must meet the needs of the recipient. Have you ever received a gift that you simply didn’t want or need? A great example of getting gifts you might not necessarily want or need is from the movie, A Christmas Story. 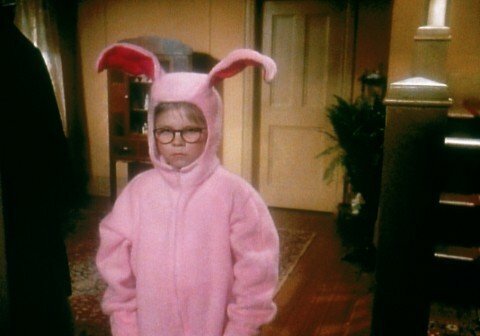 Who can forget Ralphie’s pink bunny pajamas, sent to him with the best intentions by his Aunt Clara? Most, if not all of the time, father really does know best. All Ralphie wanted was a Red Rider BB gun, but everyone, including the department store Santa Clause said, “You’ll shoot your eye out.” But Ralphie’s father secretly purchased the classic BB gun long before Christmas. Christ's purpose for coming into this world is for the redemption of fallen man. The price He paid on the cross meets the need of all mankind, "...for all have sinned and fall short of the glory of God and are justified freely by His grace through the redemption that came by Christ Jesus" (Romans 3: 23, 24). When purchasing Christmas gifts we need to remember what is being celebrated. "For God so loved the world that He gave His one and only Son, that whoever believes in Him shall not perish but have eternal life" (John 3:16). God placed an infinite amount of thought into the greatest gift ever given. God knew what we needed, knows what we want, and knows what’s best for our lives. He is even near to the brokenhearted who struggle during the holidays. Embrace the gift of Jesus Christ and receive the Joy that is yours through Him. So buying a gift begins with love. Even when you’re getting gifts for the office party, and you’re a Secret Santa for someone you don’t really know! But I’m sure you’re asking, “How can you love someone you don’t even know?” We can do this by remembering how much Christ loves us! Have you ever tried praying about which gifts to buy for your friends and family? God really cares about the little things. Try it! The Christmas season is the most wonderful time of the year, and I love everything about it. I love the food, traditions, decorations, giving, and receiving!I love the religious rituals and some of the non-religious rituals that surround Christmas. I realize some of them started in different cultures, but I believe that Jesus is above all, and in all, and we can use all of the Christmas season to point towards the love of Jesus Christ! I encourage you to embrace this season prophetically. God is doing a new thing in this generation. Don't be left out of it. Time can be our enemy on this earth, but not when we embrace the season we are in (Ecc 2-3). Whatever you are going through, find Jesus in the midst of it. We must embrace this season of Joy, Generosity, and Hope. But Christmas is more than a religious ritual, ceremony, or even a celebration it is a permanent ongoing miracle that continually changes the world, one person at a time. The greatest gift you can give anyone this Christmas season is you! That’s right. Think about how we spend most of our time on smart phones, computers, and working compared to spending time with our family and friends. Maybe, just maybe, a great gift to give the people around us is our time. But the greatest gift to give others is the gospel of Jesus Christ. After all, the key thrust surrounding the first Christmas was proclamation. The angels proclaimed, "Today in the town of David a Savior has been born to you; He is Christ, the Lord" (Luke 2:11). After the shepherds heard the good news they went into Bethlehem and found Joseph, Mary and the baby Jesus. When they had seen Him, they spread the word concerning what had been told to them about the child; all who heard it were amazed at what the shepherds said to them (Luke 2: 16-18). It only takes five minutes to share your testimony with someone else. If a gift should reflect the personality of the giver, and the needs of the recipient, should we not share the Gospel of Christ as a reflection of who we are in Christ? The greatest gift of all is receiving Jesus Christ. So here’s some shopping advice that’s better than Black Friday, giving and receiving Christ is free! As a Christian, we have the power to share this gift with others! In fact, a part of salvation is receiving power to overcome the nervousness and intimidation that tries to prevent us from sharing our testimony. A five-minute gift of your time is not only the greatest gift you can give, but it will keep those you love focused on our Savior, and change their lives forever! Please check out my video message from 2014 on the media portion of this website (www.ronniephillips.org) titled, "The Gift of Inheritance" that aired on Daystar and many other networks last week. My father and I tag teamed and it was a special time for us. In closing, I would like to thank Abba's House, my board members; Kelly Phillips, Jim Biggs, Bill Marion, Pastor Greg Collins, and my wonderful assistant Alicia Montijo. Most of all my faithful partners and friends for making the dream of RPMI a reality in 2015. We have taken the gospel across the globe this year and our best days are ahead of us.